Turk’s cap flower and the small American beauty berries. I went ahead and dried petals for my jelly. Time-consuming for you and totally unnecessary! Harvest by running your fingers over the berries, letting them fall into your bowl. These are the ingredients available in my yard today. I did not have enough American beauty berry or Turk’s cap fruits to make more than a pint of jelly. So, I took a chance on my pomegranates, which are HIDEOUS this year. I seriously thought they’d be rotted out and full of worms from the looks of them. HOW APPETIZING IS THAT? I’ll show you the yuck after the recipe. Truly hideous. Grab a medium-sized bowl and run your fingers under the beauty berries to catch them. They are total escape artists. If you have any Turk’s cap, pop off the little apples. Then, if you are interested, pull off some flowers. Remove the green part and stamen right in the garden. You can eat the little apples and the Turk’s cap flowers. A bit plain, to be honest. The flowers are sweeter than the fruits. You can eat the beauty berries straight off the plant. They are so meh. Like an unripe persimmon. I mean, go right ahead. You won’t get sick. But they aren’t anything to write home about. This part is hard because you aren’t collecting the usual fruits and berries. This is by no means a science. I ended up with 1.5 cups of these wild berries, which is not worth my canning time. I added in some questionable looking pomegranates from my yard to get 4 cups of uncooked fruits. Despite their gross appearance, the fruit was fine in the pomegranates. Underripe, of course, given the time of year. But edible. Clean them (no green parts) and boil down for 20 minutes. Add a few tablespoons of water at first so you don’t burn it. Mush the mix while boiling to ensure you get a lot of juice. Put a colander over a bowl. Ladle in the cooked mix and squish through to get what you can of the juices. You can wait until the mix is not boiling hot to do this. You need to boil a couple of jars for 10 minutes to sterilize. I chose 2 pint jars and 1 half-pint. Just wash the lids in hot water and mild soap. Do not boil them. You’ll ruin the seal. This year I have been using a low-sugar pectin for a change. The amount of sugar required for regular pectin is terrifying. It’s been a bit of an experiment. For this recipe, I ended up using more sugar than recommended by the label to ensure a solid product. Citric acid. You must make this mix acidic to ensure that it will jell and be preserved. I used the juice of 2 organic Lemon Drop citrus in my yard. Oh? You don’t have that? Then give up now. KIDDING. Get some lemon juice or something. The concentrate in the little plastic lemon will be fine. 2-3 tbs. Not too tart! Unless you like that. 3 tbs of low-sugar pectin. Whisk it in gradually. Otherwise you get a lumpy gravy. Rolling boil for 1 minute before adding sugar. Start with 1/2 cup of sugar, whisked in gradually. Rolling boil for 1 minute. Reduce to low heat. If the jelly looks decently thick (NOT watery, but kind of a syrup), you can stop cooking. Wait until it is not boiling hot so you do not burn yourself from a splash. Place lid and rim around the jelly right away and hand-tighten. Don’t go crazy on the lid. You do want to be able to open it later, right? BATH TIME! Hard boil water–enough to basically submerge the jars. Then stick them in for 10 minutes (sea level). What happens if you don’t entirely submerge them? Certain death. Kidding! I’ve never had a problem. I eat my stuff within a year. If it looks or smells off when you open the container later, throw it out! Gross. Do not eat spoiled food. Crimeny. OMG. Lid popped and sealed. My jelly is not setting. I am going to cry! What a waste of time. GAHHHH! What do I do? Hmm. It’s no longer hot to the touch and still watery. I should probably still cry. Wait! I will put it in the fridge for a bit. ooo. It was fine after an hour. Despair over. Alternative scene 2: Liquid? No. Not on my watch. (Crazy person) I’m opening these jars up and boiling again. More pectin. More sugar! I HAVE MADE A LOAF OF INEDIBLE JELLY. BOW DOWN TO THE BRICK. YOU EAT THE BRICK. EAT IT! My pomegranates have suffered this year from the heavy rains. And vicious squirrel attacks. And sunburn. A good part of the crop has been half-chewed by squirrels and has exploded due to excessive moisture. Exploded, chewed, burnt pomegranates. Ew. I was surprised to see that the ugly balls actually have decent seeds inside. They are underripe. Picked them out of morbid curiosity. Not one bit worm-addled. Huh. Still ugly as cuss on the outside, though. I decided to practice my food photography out on a jelly I hadn’t made before from berries I gathered from my garden. A few years back, a volunteer Turk’s Cap sprung up in my herb garden. I let it stay since it is a native, edible perennial where I live. I planted an American Beautyberry this past spring since waiting around for a volunteer plant of that variety seemed…well…to be a fruitless endeavor. 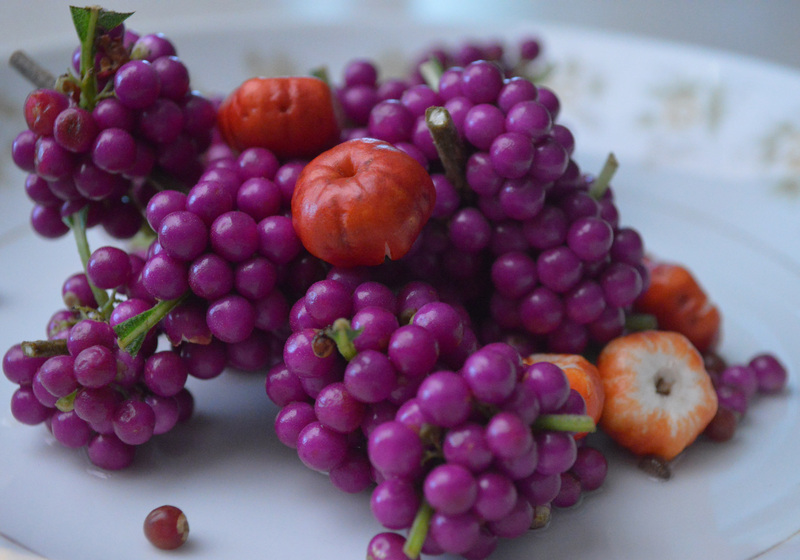 My Beautyberry is a young plant, so I wasn’t able to harvest much. I decided to grab the few Turk’s Cap fruits that had set to add to the berries. I thought about tossing in a few of the red flowers of the Turk’s Cap, but I figured I would let those stay on the plant to set more fruit for later this fall. I boiled the berries (which amounted to 3/4 cup) in a cup of water for 20 minutes. This left me with 1/4 cup of juice after I mashed the berries and strained the juice out. The lemon juice came from a Lemon Drop tree I have in my yard. It’s a more fragrant fruit than a regular lemon. 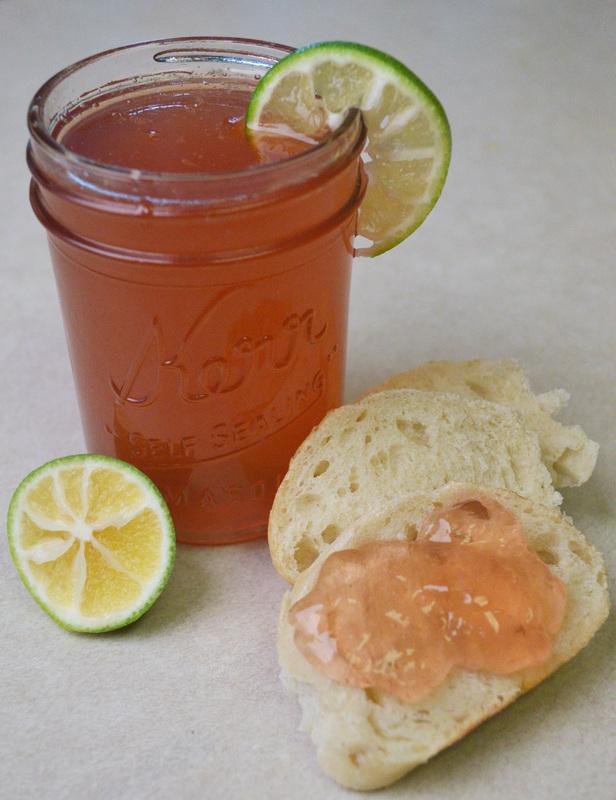 The jelly turned out nicely with a pleasant, light flavor. The berries themselves are nothing to write home about, nor is the cooked juice. It has a chalky flavor like an unripened persimmon. I was a little dismayed with the juice after I prepared it because of the yucky flavor. However, when I added the citrus and sugar, the flavors came together. As far as the photography goes, I’m happier with the first picture than the second. I should have dolled up the second one with a nice plate or doily instead of using my boring formica as a background. 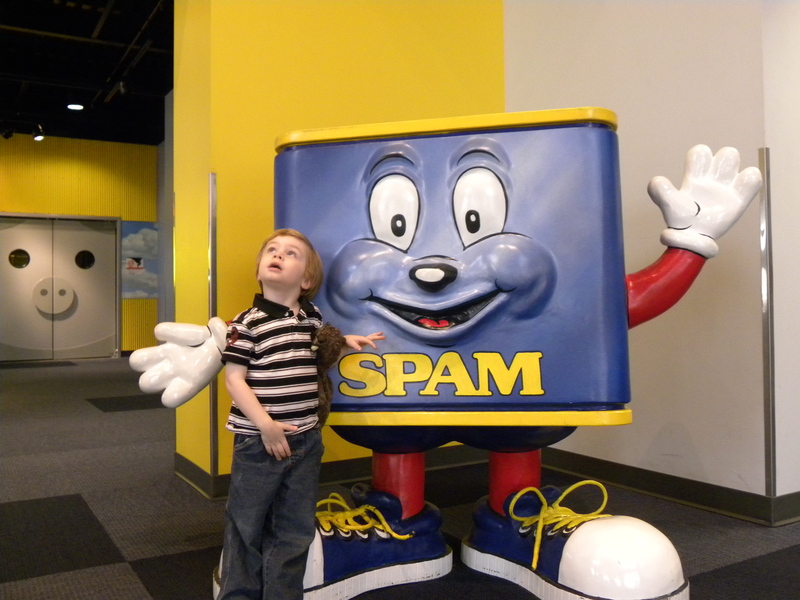 I visited Spamtown, USA. My photography is not at its best, but the subject is not easy to make attractive. The low-sodium, lower-fat single serve pouch was good on a salad. After I pan seared it like a real chef! Really, the texture is abominable unless you do that. I drizzled my salad with Stillwater Company Blood Orange olive oil and rice vinegar. I’m fussy like that. I won’t eat processed canned meat without other high quality ingredients. FYI- Austin, Minnesota (Spamtowm) smells like a bag of pork rinds, or chicharrones as we call them down here in Austin, Texas. I just felt like adding that detail. It’s important to know before you go! You can’t blame my kid for the look of…horror? Confusion? There were like a million cans of SPAM up there. No adequate explanation provided. 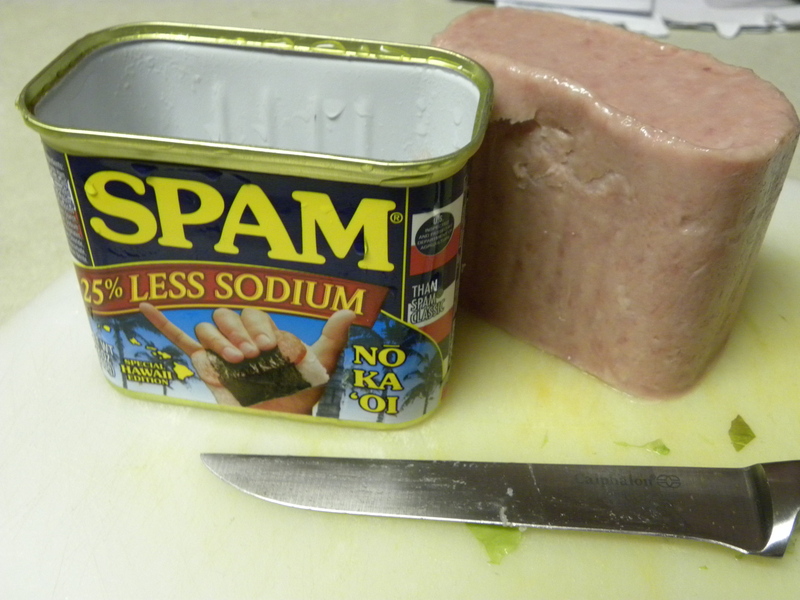 I just hope my coworkers appreciate the Spam postcards I sent them.